Wes Moore is from Baltimore, MD. He began his talk with a story of how he became a reader. He grew up a fan of the Michigan "fab five" basketball team. His mother used the book about the team as a "carrot" to get him to read (and he read it in two days!). She then got him more books about sports, which then grew into books on other topics and by a broader range of authors. Moore grew to learn that we lived in an extraordinary world. He wrote a book called "The Other Wes Moore." What is inside a book is what the author wants to share. What is on the outside of the book is what the publish wants to share, in order to get people to purchase the book. It was the publisher who suggested the title. He didn't like it, but recognized that there was a good reason for it. The focus of the title is on the word "other." Our world is full of people who are considered "the other." Moore - "Part of the beauty of your job [as a librarian]... is you create spaces where everyone knows they're welcome....you welcome them all." "In your work, there is no others. There's just the people you serve." Prior to being a Rhodes scholar, he went through tough years after his father died. As a teen, his mother sent him to a military school. Being sent angered him and he tried multiple time to run away. His mother told him that too many people had sacrificed for him to go to that school. Moore realized that he had to be willing to be pushed (and to push) so he would succeed. Moore finished high school there and went into the military. He ended up going to Johns Hopkins University. 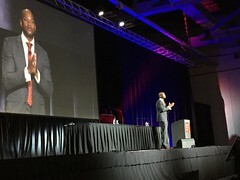 Wes Moore told us the story of the other Wes Moore, of that Wes Moore's crime, and how he - the author - has come to know the Moore who is in prison. He has come to know how that Wes Moore's fate was sealed long before the crime he committed. He knows there is no single answer that will help all children. He knows, though, that raising children is complicated. "Potential is universal. Opportunity is not." Education is what every child should do so that their future is as bright as it possibly can be. He believes in the importance of faith, family, policy and housing. There is also the importance of expectations. Are we products of our environments? The other Wes Moore said that "we are products of our expectations." The expectations that people have of themselves come from the expectations of others have of them. Those expectations are internalized. "Make sure that it mattered that you were ever even here." - wisdom from one of his military school teachers. The future is not promised. While we are here, let's make our time count. We librarians provide the tools of that can make great changes. "There is no piece of military equipment that can combat a library." "The world is bigger than what is directly in front of me." "Your power...is that you control freedom more than anybody else...how does a person thinks about their own life...there is no institution that more controls that than you."